When I was a young lad, I have to say that I was a bit jealous of my gaming friends. You see, I had a Master System while they all had NESes, and even though that’s not meant as a criticism of Sega’s original - and criminally underrated - entry into the global console market, I did find myself deeply yearning for the next time I could go round one of my school mates’ houses and get another fix of Megaman 2. I can’t imagine how I would’ve reacted if I’d found out one of these friends had a Neo Geo though. Ownership of SNK’s legendary unicorn of a platform was spoken about like myth in the UK - thanks to the lack of a Western release, ridiculously high import prices and a whole range of games that blew most of their 8 to 16-bit contemporaries out of the stratosphere. But if you were one of those lucky few who happened to live in an abode of comfortable wealth and benevolent parenting, all I can say is - I’m sorry. Going through primary / elementary school must have been hard finding out that most kids only wanted to be your friend because you had that really awesome games system they’d have to sell a sibling to play. But hey, at least it meant you got good prep for the purely transactional nature of some of your relationships in adulthood. And you also got to play games like Baseball Stars 2 to offset all the betrayal, so stop crying already. 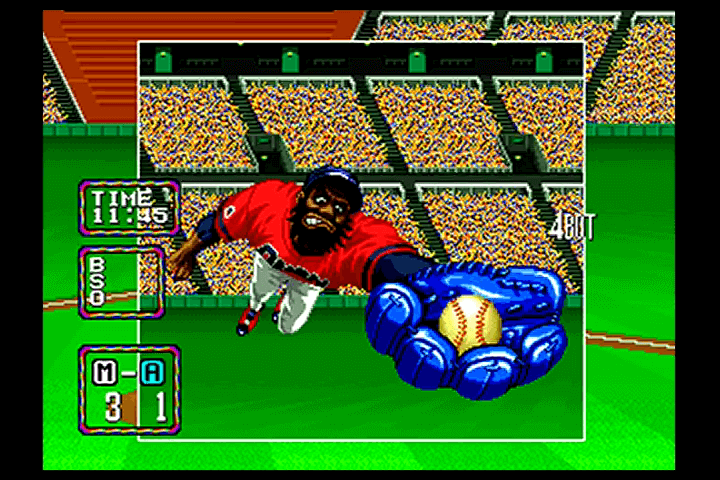 Thankfully, those without burgeoning bank accounts now have the pleasures of free emulation, and in recent years, the cheaper Neo Geo X handheld, to experience the rampant fun that Baseball Stars 2 can provide. But what separates this 1992 sports sim from any other competitor? Why even talk it up when compared to the vast technical superiority that current-day baseball games lord over it? The average MLB video game these days offers so much depth - from managing college drafts and farm teams in franchise mode, to managing your own creation’s eyebrows in career mode. 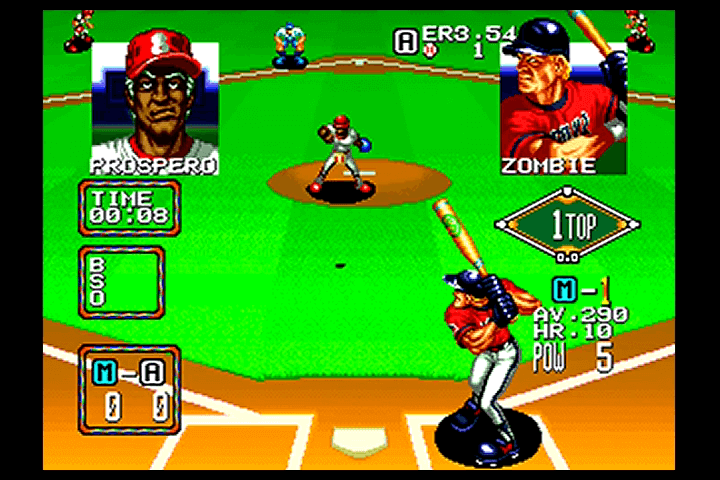 Baseball Stars 2 meanwhile offers just two options of play (season and two-player), a paltry 12 teams to play as, and doesn’t even have any official licensing. 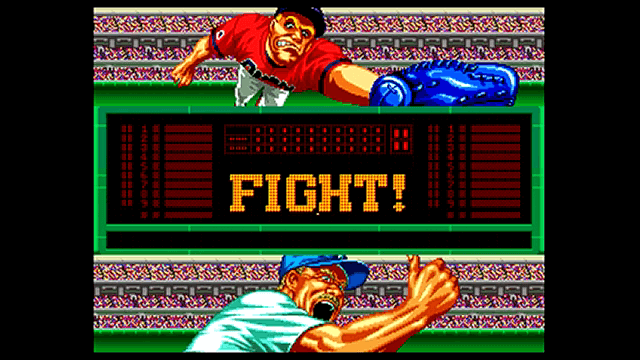 So without a sense of real major league relatability or even an old MLB has-been to tout itself with, what exactly does Baseball Stars 2 offer to anyone, apart from being an old, pixelly relic from SNK’s past? 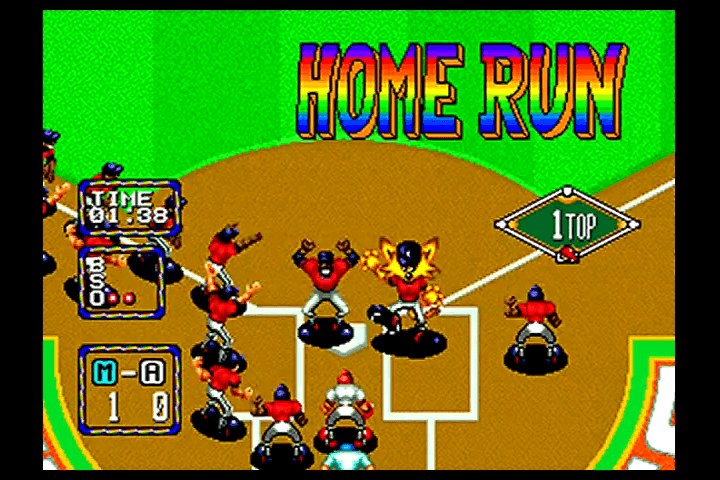 Well, for starters: kids from the NES age may well remember its predecessor: 1989’s Baseball Stars, which many at the time thought was one of the best sports sims in general, let alone the best dedication to the Old Ball Game. For its time it offered some surprisingly sophisticated gameplay and even a fully-fledged league mode - making it a breakthrough of sorts. But even legacy alone cannot make a sequel good. 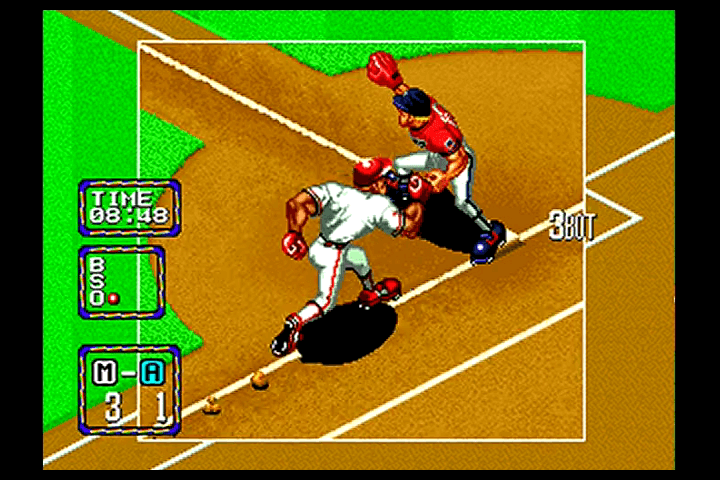 So instead of expanding on the original’s level of detail, Baseball Stars 2 puts a greater focus on what made it fun by doubling down on the key factors that made so many of SNK’s games great - larger-than-life characters and graphics, bombastic sound effects and gameplay that was easy to pick up, but so, so satisfying to play. 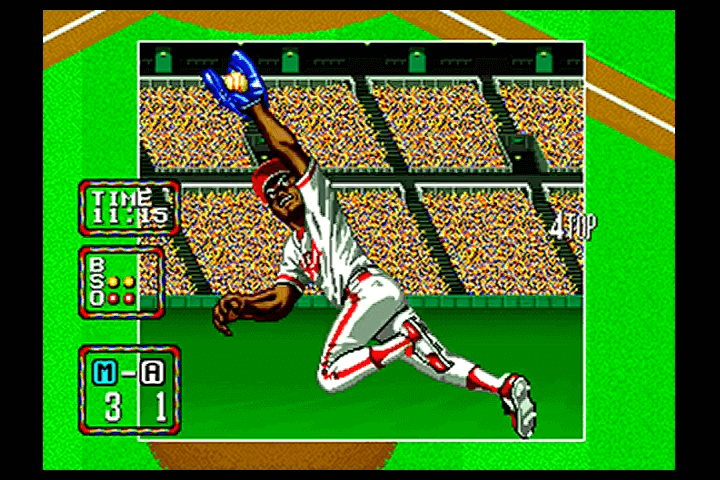 Using the term ‘sim’ to describe it is a misnomer - Baseball Stars 2 is as arcade as arcade gets. It doesn’t need some roided-up slugger on its title screen. It’s already plenty roided-up itself. 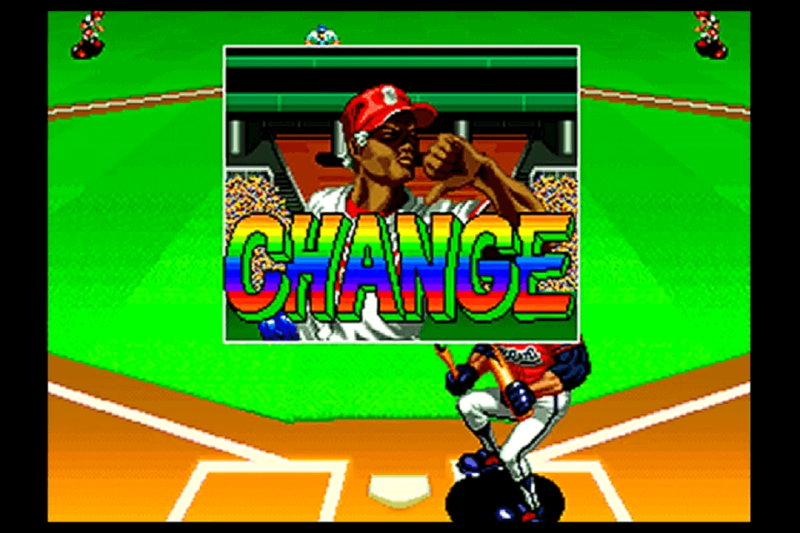 Starting a game - once you’ve gotten past the Max Headroom-esque semi-lunacy of its ‘BASE-BASE-BASE-BALL’-tastic intro - is as easy as hitting the ‘A’ button twice: once to choose the game mode, and again to choose your team. As previously mentioned, there are no real teams for selection here - but the myriad of colourful teams from around the world you can choose from (hailing from baseball hotbeds like New York to, erm, Sydney) bring more than enough character to make the absence of authenticity trivial. And once you have made your decision, in you go for the top of your 1st inning. No entry for player name, no settings to tweak. You’re up and you’re at bat - so start swinging. Even in these opening moments, the humour and the eccentricity of Baseball Stars 2 is on full parade. In a way not completely dissimilar to another SNK series, Metal Slug, a lot of Baseball Stars 2’s charm can be chalked up to its animations. 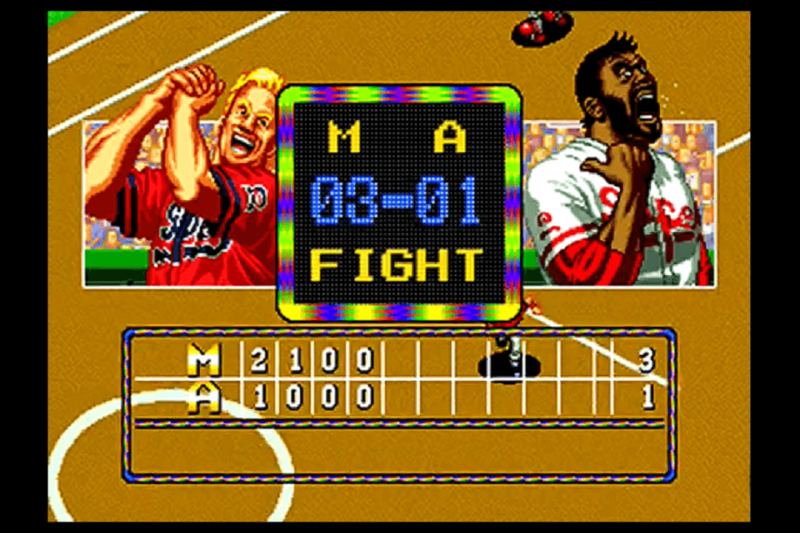 From the gum-chewing portraits of the pitcher on the mound as they anxiously figure out their next pitch, to the cartoonish exaggerations of the fielders as they attempt to pluck falling balls out of the sky, Baseball Stars 2 is packed full of neat, amusing little touches to compliment its already over-the-top presentation. 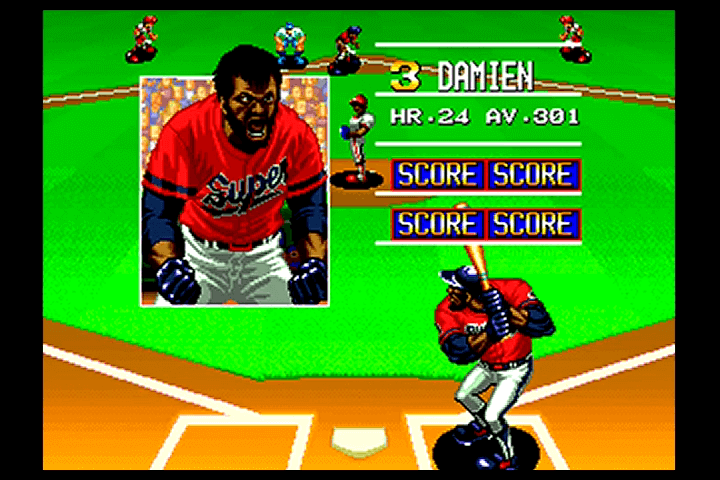 This is particularly notable in your team’s player portraits as well - each of which flash up on screen as they step up to the plate to bat. Although most of these portraits repeat across all of the teams, it’s great to put a face and a personality to the big MVPs in your clubhouse. You’ll soon figure out who your go-to home-run hitter is, or who can at least score that crucial base hit that’ll get your team the win. It also acts as a handy key for strategy too - as soon as that dude who looks like he’s hulking up is in bat, you’ll know exactly it’s time to bring your ‘A’ game on the pitching mound, or face annihilation. In fact a lot of these visual cues and nutty, skipping voice samples are pretty useful gameplay indicators in their own right. Once your pitcher needs relief, you’ll know - he’ll either look like he’s had a stroke or start bugging out after suffering consecutive hits off of his balls. Your first pitcher also starts with a finite set of ‘special’ techniques - basically either fast or knuckleballs, which can be triggered by holding down or up respectively while pitching - that will tire them out pretty quickly if used all the time. 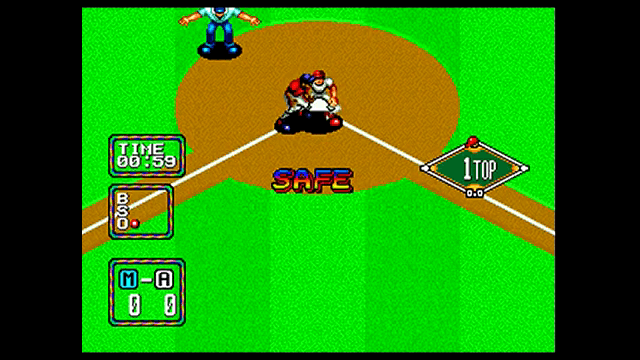 Careful management of your starter on the mound, which is doable by taking advantage of the subtle direction controls available for regular pitches, is therefore key to winning in this game. Although the game does give you a generously deep bullpen to allow you to switch your starter out for another, there is a presence of momentum at play. Pull him off too soon and you may find his replacement suddenly gets shut down in brutal fashion - affecting both his and your confidence in striking the batting team out, and finding yourself on the losing side of the scoreboard. As much of an enjoyable challenge pitching can be though, batting is easily twice as fun. With some enduringly decent pitching AI, hitting a home run against the computer can be a little tricky at first. But when you get both the pitch and your timing right, that satisfying ‘smack’ of your bat to send one into the outfield is just a precursor to a wonderful moment that follows. 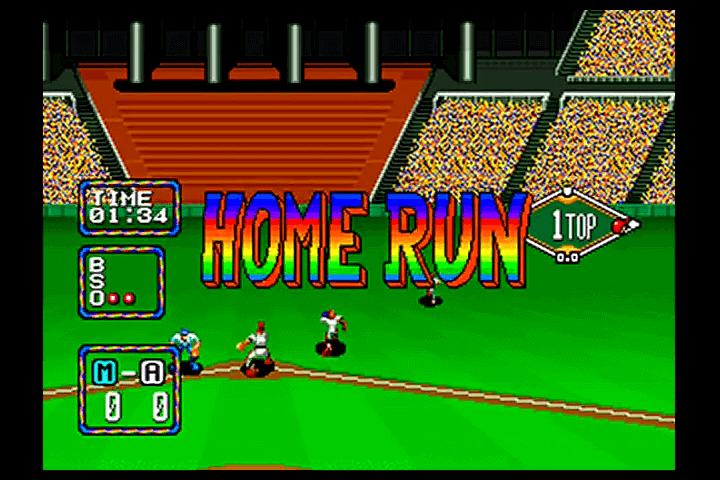 A celebration completely in line with the game’s sense of madcap fun ensues - the words ‘HOME RUN’ flash in psychedelic letters on the screen, a synthesized faux-guitar solo riffs off, and your lucky hitter will make his way around the diamond before celebrating on home plate with the goofy mascot. It’s daft, but it’s the spirit of the game in a nutshell. And even if you’re having trouble reaching the distance with your shots, you can even boost them with a ‘power up’ too - replacing your current bat with a comically oversized one instead. Just like with the ‘special’ pitches though, you only get a limited amount of them to use per match - so it’s crucial to have at least one left for that all-important ninth inning. With its portrayal of baseball set to overdrive and its sense of humour well off the wall, Baseball Stars 2 is therefore a perfect game for a two player showdown. Its single-player, 15-game league mode is definitely entertaining (if ridiculously long given the lack of a save option), but all of the game’s in-your-face attitude was definitely intended as a means to earn bragging rights over a human competitor. In many ways, it reminds me of another sports game I played in my younger days - a certain cult classic by the name of Sensible Soccer. Anyone familiar with that title (and if not, more’s the pity) should see the same sense of character in both SNK and Sensible’s respective efforts, even if the two software companies operated vastly different from each other. There’s a similar use of bright, eye-catching colour in the graphics, and there’s a comparable use of comedy in both the fictional team names and their players (the New York Monsters’ employment of players named Alien, Jason and Freddy is certainly akin to Sensi’s use of teams like Ancient Gods FC and Bad Words United). But crucially, both games took the fundamentals of their subject sports and maximised the fun that could be had from them, making them both a breeze and a blast to play. And when your game is that simple to get to grips with and that gratifying to win at, the only natural result is that it becomes the perfect means to figuratively beat a bitter rival down with - frequently and gleefully. 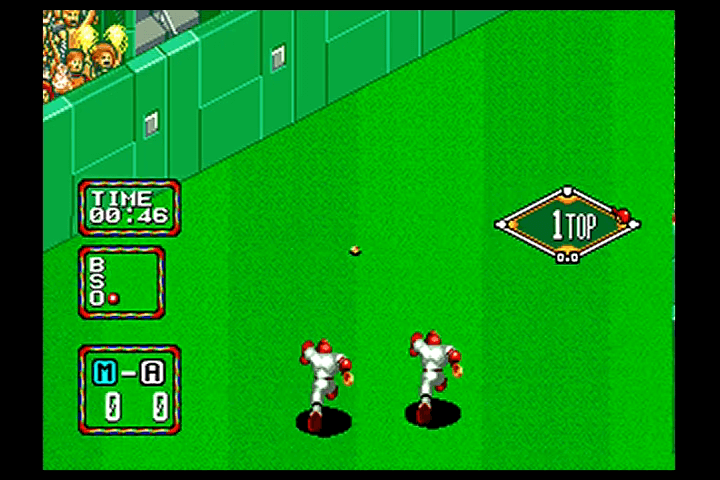 The one thing that stops Baseball Stars 2 from being a full-on perfect classic of the 16-bit era is some baffling fielding controls - there are two options on whether to make your fielding Manual or Automatic (which, confusingly, also determines what teams you can pick), but both come with their frustrations. Automatic is particularly infuriating because even if it seems like your fielders move correctly and without assistance, the game will still drop you into manual control at the last minute, forcing you to make the critical catch without telling you when it’s handing over. It’s deeply annoying, but on the plus side, neither you or your opponent will know how to do it first off - so you’ll still be on a level playing field at least. It’s still not enough either to derail the seriously mental fun that a game of Baseball Stars 2 can provide either - even in this very day. It’s certainly one of the feathers in SNK’s cap - up there with those Metal Slugs and Kings of Fighters in fact - and even if that’s still not enough to convince you, you can lay your eyes on a few innings of action below and see for yourself. You can still get yourself a copy of Baseball Stars 2 in a number of ways. By far the most convenient is via the PC, where it is available as a purchasable title on Steam. Retro enthusiasts may want to look toward finding a Neo Geo X handheld. Released in 2011, it is still purchasable via Amazon or Ebay, although prices may be steep. Specifically, its Gold Edition bundle includes Baseball Stars 2 as one of its included titles - and is the version of the game that I personally own.